I've been a fan of Mark's Daily Apple for quite a long time. If you don't know the blog, Mark basically invented the "Primal" diet, which is sort of paleo with dairy added. Mark espouses the 80:20 principle of eating: basically to eat well 80% of the time and compromise a bit around the edges the other 20% of the time, as more realistic than aiming for perfection. Odds are good that you've seen the images from the book "Hungry Planet: What the World Eats" by Peter Menzel and Faith D'Aluision as they've been blogged and shared all over the place. Basically, Menzel and D'Aluisio traveled the world documenting what we eat, taking photographs of families with a week's worth of groceries. The more developed countries bought gobs of food-like products; the poorer countries tended to buy lots of fresh vegetables and fruit. The only family from a less-developed country with less fresh produce than the developed countries was a family in a refugee camp that had only grains and dried meat; pretty much everyone else eats better than the first world does. Apparently, you don't HAVE to eat mostly crap just cause you're from a first world country! I just LOVE this slideshow, nearly every picture has enough fresh produce to qualify these folks to live in third world countries! And yet, most of them live in the US, where agricultural subsidies make fresh produce one of the least affordable foods available, because our goverment has decided that food-like processed products composed of soy and corn should be cheaper than tomatoes, apples and spinach. 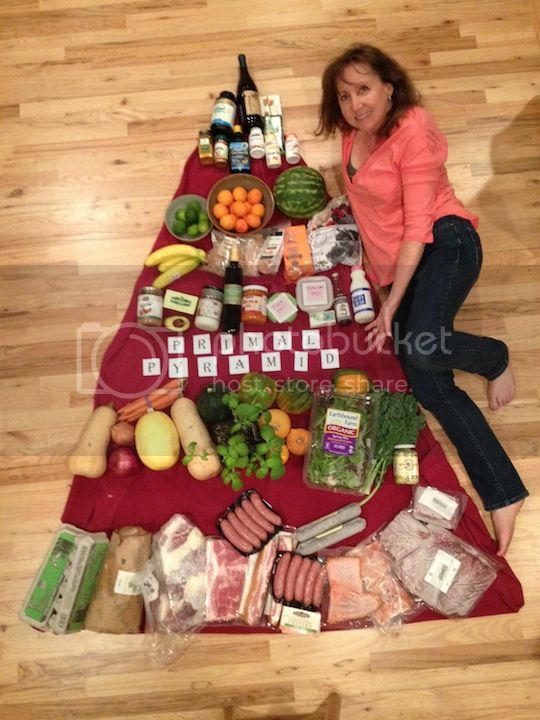 I also want to invite all the critics of the paleo/primal diet to EXPLAIN to me exactly what is so unhealthy here? It's rare to see people who regularly get even the minimal USDA recommendations for fruits and vegetables; Mark's readers are obviously getting much more than half their diet from fresh produce. 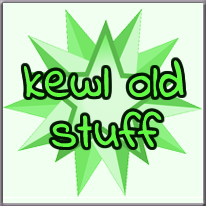 Besides the blog, Mark runs a store Primal Blueprint, where he sells many excellent, informative books, "state-of-the-science health supplements designed to address the challenges of living with hunter-gatherer genes in a completely modernized world" and miscellaneous cool stuff like t-shirts, accessories, etc. If you visit his store through my link, I will receive a small commission on your purchases and you will receive my gratitude. Thanks! 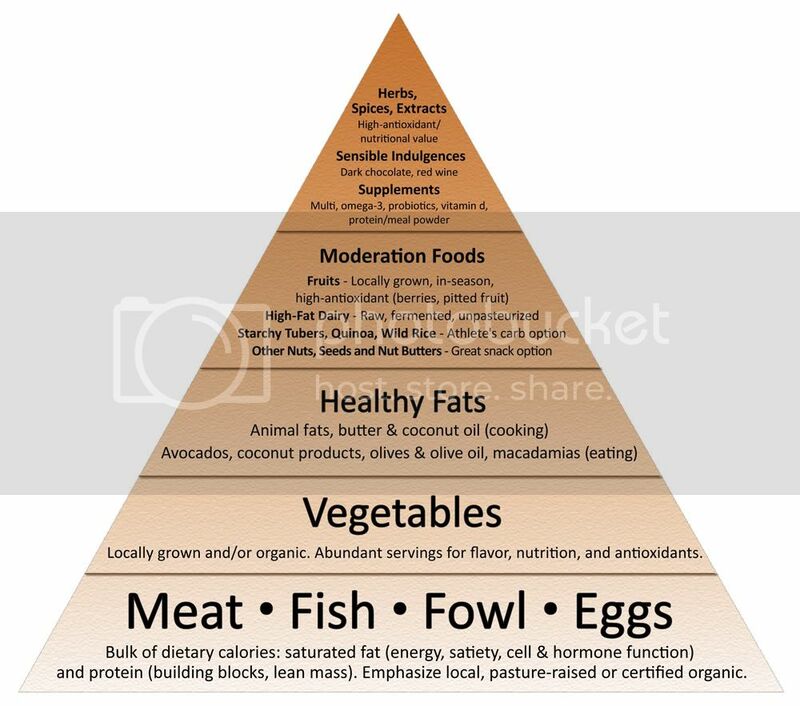 Mark has an old post where he describes the primal diet in comparison to the USDA pyramid; my favorite contest entry is from Vanessa Marsden, who cleverly laid out her groceries in a Primal pyramid.